Rockland County is the smallest county in New York State outside the five boroughs of New York City. It is bounded by the Hudson River on the east, the State of New Jersey on the south, and the Ramapo Mountains to the north and west. Although the county consists of only 176 square miles, it is a land rich in history. To a newcomer, Rockland County may appear to be border-to-border housing developments built over the past forty years, but its historical roots go back almost four hundred years—more than ten thousand years, if you include Native American history. Records indicate that the first residents were the Indians of the Delaware or Lenape Nation, who were scattered throughout the county in small bands. Henry Hudson is credited as the first European to set eyes on what would become Rockland. In 1609, Hudson, an Englishman under commission to the Dutch East India Company, sailed up the river that would one day bear his name. He anchored in the Tappan Zee, as well as in the widest point in the river off what is now known as Haverstraw. He mistakenly assumed that he had found the legendary “Northwest Passage” to India and continued his voyage upriver to Albany before realizing his mistake and heading for home. Early attempts to settle the county by the Dutch were generally unsuccessful. In 1664, the Dutch handed over the territory to the English. Yet the Dutch did leave a legacy in place names such as Duhderberg, Sparkill, and High Tor, as well as a small collection of unique sandstone houses. In 1686, the Duke of York, later to become King James II of England, established the county system and designated our area Orange County. That county included all of present-day Rockland and part of what is now Orange County. In the same year, the town of Orangetown was created, which encompassed all of modern Rockland County. The precinct of Haverstraw was established in 1719 when it was separated from Orangetown and permitted to hold its own meetings and elect its own officers. Haverstraw was made a town in 1788 and included the present towns of Clarkstown, Ramapo, and Stony Point. Clarkstown and Ramapo became towns in 1791; it was not until 1865 that Stony Point became a town. The first half of the eighteenth century saw much of the land cleared, homes built, grist mills and sawmills erected on the numerous small creeks, and general stores opened at Haverstraw and Tappan Slote (present-day Piermont). Because of the lack of roads, travel was largely confined to sloops that made regular trips up and down the river. In 1700, the DeWint House, which still stands, was built in Tappan; it later served as George Washington’s headquarters. The first County Courthouse was built in Tappan in 1691. However, by 1737 the residents of the northern part of the county (modern Orange County) were complaining about the difficulty of crossing the Ramapo Mountains, a formidable barrier, and attending County Court in Tappan. In response to their demands, sessions of the County Court alternated between Goshen and Tappan. In 1773, a second County Courthouse was built in Goshen. In 1774, the county seat was moved to New City, but this location proved even more inaccessible: Tappan could be reached by river, whereas access to New City was limited to the poor roads. By the 1770s, the movement to separate what is now Rockland from greater Orange County was in full swing—a process that was completed in February 1798. During the American Revolution, Rockland became an important crossroads—a vital link between the northern and southern colonies, and a scene of conflict and treason. On July 4, 1774, the people of Orangetown gathered in Yoast Mabie’s house in Tappan to adopt a series of resolutions that contained the seeds of the great principles that later would be embodied in the Declaration of Independence. That both the Orangetown Resolutions and the Declaration of Independence were adopted on July 4 was fortuitous coincidence. There were American fortifications at Sidman’s Fort at Suffern, a blockhouse at Palisades, and larger forts at Stony Point, Bear Mountain, and Fort Montgomery. Entire armies and vital supplies passed through Rockland on their way to war. The King’s Ferry in Stony Point and Dobb’s Ferry in Palisades linked New York and the southern colonies with New England. King’s Ferry was used by Washington’s Continental Army many times, and in 1781 it carried the French allies on their way to the final battle at Yorktown. In 1775, Dobb’s Ferry, run by Molly Sneden, a Tory, carried Martha Washington on her way to Massachusetts to visit her husband. Two important battles took place in the county: the capture by the British of Fort Clinton at Bear Mountain in October 1777 and the victorious attack by General “Mad Anthony” Wayne’s army on the British fort at Stony Point in July 1779. Several small battles were fought in the county when British landing parties attempted to come ashore at Nyack and Haverstraw, only to be beaten back by the local militia. Rockland County also became famous for the treasonous plot by Benedict Arnold to sell the plans for the fortifications at West Point to the British. His co-conspirator, British Major John Andre, was captured with the plans in Tarrytown, on his way back to the British lines. Andre was taken to Tappan, where he was tried, found guilty, and hanged. Rockland was the site of the first formal recognition of the new nation by the British. On May 5, 1783, General Washington received the British Commander, Sir Guy Carleton, at the DeWint House to discuss the terms of the peace treaty. On May 7, Sir Guy received Washington aboard his vessel Perserverance. On this day, the king’s navy fired its first salute to the flag of the United States of America. After seven years of war, Rockland County was in a sad state, having been ravaged by British troops, Tories, and plain outlaws. Homes had to be rebuilt and farms, restored. In the period following the war, Orange County consisted of four townships: Goshen and Cornwall in the north and Haverstraw and Orangetown in the south. Since Haverstraw and Orangetown had borne the brunt of the war, the county supervisors voted, at their annual meetings in 1779 and 1780, to decrease the taxes in these towns and increase taxes in Goshen and Cornwall. This stimulated a movement in the northern towns for separation. In 1793, residents of the northern towns who wanted a county seat in Goshen began discussions with a group of residents in the Newburgh area. Newburgh was then part of Ulster County, and its citizens had to travel thirty miles north to conduct official business. Finally, all parties interested in dividing the county came together, and the New York legislature created Rockland County while also realigning the borders of northern Orange and Ulster counties. Rockland officially became a county on February 23, 1798. 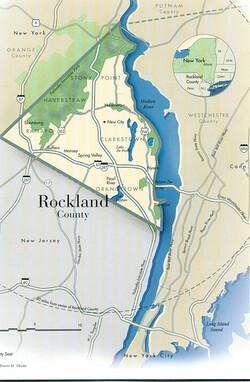 In the national census of 1800, the total population of the newly created County of Rockland was 6,353. The town of Ramapo—or Hempstead, as it was known until 1829—had the largest number of residents, at 1,931. Clarkstown was next, with a population of 1,806m followed by Orangetown, with 1,337. Haverstraw, which included Stony Point, had 1,229 residents. By this time, Native Americans had virtually disappeared from the county. Slavery existed in a diminished form until 1828. Improvements in transportation set the pace for development in the first half of the 19th century. Roads were primitive, and transporting products from the western end of the county to the Hudson River was very difficult. After legislative approval, it took seventeen years to complete the Nyack Turnpike, which connected Nyack to Suffern, while the Orange Turnpike provided an inland route to Albany. Present-day Route 59 roughly follows the path of the Nyack Turnpike. In 1827, steamboat travel debuted from Nyack to New York City, attracting competition from steamboats later built at Haverstraw and Tappan. To facilitate steamboat traffic from Tappan Landing, a road was built over the marshes to the end of a 500-foot pier, which within a few years became the terminus of the Erie Railroad. Eleazar Lord planned a railroad through the Ramapo Pass to serve New York’s southern tier of counties. Work began in 1838, and the 484 miles of track to Dunkirk on Lake Erie was completed in 1851, making it the second-longest railroad in the world. President Millard Fillmore and Secretary of State Daniel Webster, along with a score of national and state officials, boarded the train at the Piermont Pier for the first trip. Although agriculture remained dominant in Rockland County well into the 20th century, industry gradually grew. Quarries in and around Nyack and in other parts of the county provided stone for many structures outside Rockland, as well as within the county. Building stone from local quarries went into the Old Capitol at Albany, the old Trinity Church in New York, and the first building at Rutgers College in New Jersey. Large deposits of clay in the Hudson River brought about the beginning of brick manufacturing in Rockland in 1771; Haverstraw became the brick-making center of the East in 1817 when James Wood discovered that coal dust could be mixed with clay, reducing the price of the bricks. In 1852, the industry was given fresh impetus by Richard VerValen’s invention of the automatic brick machine, which tempered the clay, pressed the malleable clay into molds, and produced bricks of uniform size. For the next seventy-five years, North Rockland was the source of building materials for the colossal growth of New York City. At one time, the Town of Haverstraw had more than forty-two brickyards. In January 1906, an entire area, undermined by tunneling below the surface, was engulfed in a landslide of clay that took twenty lives and destroyed part of the business district. The use of steel and concrete rather than brick in construction contributed to the decline of the industry, and the Great Depression of the 1930s struck the final blow. In post-Revolutionary Rockland, manufacturing was varied. Because of the proximity of iron mines, numerous metal products were made—plows, hoes, railings, nails, machinery, even cannonballs. Rockland factories made shoes, straw hats, silk and cotton cloth, sulfur matches, and pianos. Foremost among Rockland’s early industrial enterprises was J. G. Pierson and Brothers, a large-scale nail manufacturer whose overwhelming success spurred the settlement and development of western Ramapo. While reliable transportation was important to manufacturers such as Pierson, even more essential was water for steam power and timber for fuel. The Ramapo Pass offered a plentiful combination of both. For this reason, Pierson relocated his operations in 1795 from New York City to a site along the Orange Turnpike at the base of Torne Mountain. Pierson immediately set to work on a 120 foot dam across the Ramapo River. By 1813, his Ramapo Works was producing a million pounds of nails annually. The addition of a cotton mill in 1814 nearly doubled the size of the works, which in 1822 were incorporated under the name Ramapo Manufacturing Company. With the passing of the Pierson brothers, the Ramapo Works effectively shut down after 1850. During its heyday, however, the Pierson nail factory was a powerful economic stimulus to the region because of its links to existing agricultural and commercial trade. In the process, Ramapo developed into an agricultural marketplace and a locale for manufacturing innovations. For more than half a century, the only school in the county was established by the Tappan Reformed Church. The first schoolhouse was built in Tappan in 1711 and was still in use as a school until 1860. The next mention of a school in Rockland County is in the Town of Haverstraw Highway Commissioner’s report in 1796. Schooling in the late eighteenth century and early nineteenth century in Rockland County was done in the home or by private schoolmasters in their houses or in their pupils' homes. Thirty-four school districts had been established in the county by 1829, as compulsory education spread. They were organized on the general concept that a three-square-mile area with a centrally located building would allow children age five and older to walk to school. By the middle of the nineteenth century, matters of public interest began to receive attention. Debating societies were formed in Haverstraw, Nyack, and Nanuet. Halls and “opera houses” were built. Newspapers were established in Nyack and Haverstraw, and a fire in Haverstraw in 1854 brought about the formation of the first volunteer fire company. Religion also played a prominent part in Rockland’s history. The earliest Dutch Reformed churches—and, later, Presbyterian churches—laid the groundwork for other Protestant denominations to flourish in the county. The first Roman Catholic Church in Rockland was St. Peter’s Church in Haverstraw, which opened in 1847. Haverstraw was also the site of the congregation of the Sons of Jacob, which completed and dedicated its first temple in 1889. As they did in the American Revolution, the men and women of Rockland have served in all of America’s wars. During the War of 1812, Rockland turned out proportionally more soldiers than any other county in the state. Four Union generals and four Medal of Honor recipients lived in Rockland. One of the best-kept secrets in the history of the county was the movement of more than a million troops through Camp Shanks in Orangetown during World War II. The dawn of the twentieth century saw the number of farms in Rockland begin to decline and industry begin to rise. For example, the California Perfume Company was founded in Suffern in 1897; today, it is a major cosmetics company known as Avon. By the 1920s, Rockland County had become home to many artists, writers, and stage celebrities. The painter and muralist Henry Varnum Poor; the playwright Maxwell Anderson; and the composer Kurt Weill and his wife, the actress Lotte Lenya, lived on South Mountain Road in New City. The world-renowned artist Edward Hopper lived in the county, as did the actresses Helen Hayes and Katherine Cornell and the memorable actor Burgess Meredith. By 1950, fewer than 150 farms remained in Rockland. Today, that number has been reduced to handful. In 1950s, homes were built at a rate of more than one thousand per year. Much of this growth was brought about by the opening of Tappan Zee Bridge in 1955 and the completion of the Palisades Interstate Parkway and the New York State Thruway during the same decade. Rockland’s rural character was changed forever. Among Rockland County’s contemporary qualities are its rich history, its economic scope, its unparalleled parkland, and its diversity of population. With its extensive attributes, Rockland County is primed for the challenges of the new century.